The apartment is located in the center of Old Town neighborhood, walking distance from the Astronomical Clock in Old Town Square. While it is close to famous bars and pubs it is quaintly hidden in a small and very quiet street. The apartment is newly refurbished, 78 m2, 2+K, in a beautiful building from the early 19 th century. It is situated in the historic Jewish quarter in the Old Town neighborhood. The apartment consists of a spacious living room open to the kitchen, one large bedroom with a double bed, bathroom, and a walk-in closet. There are two separate doors to the bathroom from the living room and the bedroom. There is one bedroom with a queen size bed (180cm) and one folding sofa that sleeps two (120cm) in the living room. If you need a craddle for a baby, we can provide it too. The place has a nice atmosphere and it is very easy to stroll around the beautiful streets. There are many restaurants and bars nearby that can be easily reached on foot. The whole apartment is available for you. You enter the apartment from the main hall. I will be available during your stay on call. It is conveniently situated within walking distance of the Metro A line, one stop to Mustek station in the city center. The easiest way is to walk because everything interesting is just around the corner!There is also public transport available close by - metro station Staromestska (A line), bus and trams. You can also take a taxi. I can also arrange an airport pickup/drop off for you by for EUR 30/1 way. There is a spacious bathroom with a toilet, shower corner, bath tube and two sinks. Bright, spacious apartment in an ideal location! Perfect place to stay that is close to everything in Old Town, yet still fairly quiet. Owners were very friendly and accommodating. My only suggestion for improvement would be to offer better bed pillows and extra towels/facial tissues in the bathroom. Otherwise, a wonderful stay! The property is in a superb location. It's large and roomy with a big bathroom and closest. The sofa bed is probably better suited for children. The master bed mattress is a bit thin. Great Place in Prague to stay Jana and her husband were fantastic. We had issues with our phone and finding the location and Jana and her Husband waited for us to finally figure out where to go after we lost phone service. The apartment was in a fantastic area close to everything. We walked everywhere. A little store is close for the basic foods. And great restaurants surround the place. Thanks again Jana!!!! 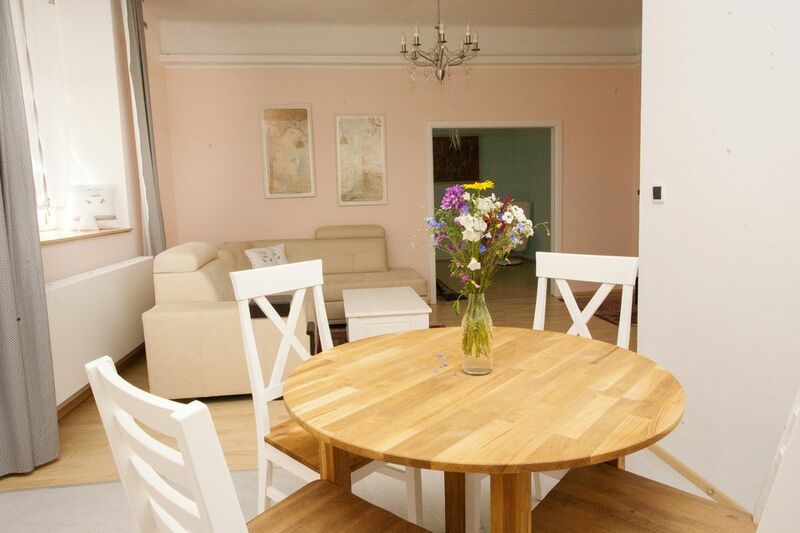 This is a great apartment from which to see Old Town Prague. You can walk to all the beautiful sites of Prague and there is easy access to subway and tram connections. The apartment is spacious and perfect for three people. It is beautifully decorated and quiet due to its' location on a non-trafficked side street. The neighborhood has lots restaurants from Czech to trendy themed cafes and clubs. If shopping is your thing, the apartment is accessible to high end, tourist or shopping in some of the nice malls in the area. Jana was great to communicate with, unobtrusive yet efficient and prompt response to inquiries. I cannot say enough good things about my experience and we would definitely stay here again. The apartment is in the Jewish center close to the old town square but on a little side street with no traffic. Great heat and hot water with a huge bathtub and shower. The flat screen t.v. just had 4 news channels in English. The kitchen had the basics with a single serve coffee maker. Jana left good info. and was helpful with questions that we had. We would stay here again. We stayed for six days in September. This place was great, close to the old town square and most other attractions. Jana was easy to work with. Love the apartment and hope to return soon.